Once again it is clear upon early inspection that Fenwick’s EliteTECH ESMS63MH-F rod is very well crafted. It’s a great looking rod with a soft green color and cork like handle, and the TAC inlay set off nicely from the fine grain cork. It has a split grip and the handle fits nicely in the hand offering a full hand feel. After the reel was placed in its seat, the EliteTECH ESMS63MH-F balanced out nicely. The rod did seem to weigh a tad bit heavy for a 6’3 medium heavy, but wasn’t completely uncomfortable. We definitely were anxious to see how this rod would perform out on the water and catch some smallies. Fenwick’s EliteTECH ESMS63MH-F was paired up with a Penn Battle 2000 Spinning reel with #8 Berkley Trilene XL and a Symetre 2500 spooled with a 6lb Trilene gold fluorocarbon. The weather ranged from cold and dry with water temps in the low 40s to warmer temps of 60-85 degrees in both wet and dry conditions. The lakes surroundings ranged in depths of 4 -20 feet. When it came to presentation we made sure that we had an arsenal to attract those bass. We used jigs, T-rigged worms, soft jerkbaits, drop shots, finesse lures and swimbaits. The EliteTECH ESMS63MH-F rod casts a great distance and were surprised by the accuracy for a spinning outfit. The full grip and quick tip lent itself to snap casting with this combo. The cast was smooth. The tip loaded with 1/8 jigs, lighter than recommended for the rod. Since the rod is a little beefy, casting a heavier setup was no problem. How sensitive a rod is can be what stands between you and a big bass, and the EliteTECH ESMS63MH-F did not disappoint. Given the design of the tip and grip, and the TAC inlay, the rod is very capable of conveying what’s going on in water from the line back to your hand. Make no mistake about it, even with the fairly light tip; this is a brute of a stick! It has a backbone to move large fish off of the bottom and power to turn them when they are headed for the weeds or wood! The EliteTECH ESMS63MH-F was controllable on every fish hooked. 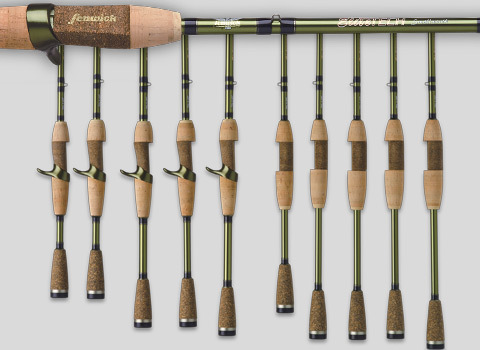 Again, Fenwick has delivered a rod with power to help secure that big catch. There’s never really much of a question as to whether a Fenwick rod is durable. They design well-crafted, high quality rods that you can depend on through years. The EliteTECH ESMS63MH-F rods were tested multiple times in various conditions throughout the year, and after all that time the rods still look as new as the day they were received with the exception of some weathering on the cork handle (a good sign that a rod has seen some action!). The general consensus is the EliteTECH ESMS63MH-F rod is sharp looking and has a great design. As for the comfort of this rod there was a difference of opinion. The rod may be a bit heavy for someone who prefers super light weight rods. One reviewer found the oversized handle section quite comfortable for someone who has larger hands than most. There wasn’t much fatigue from fighting the weight of the front of the rod, due to the balance point being too far forward. It will come down to preference and perhaps the size of your hand. T-Rigged worms, shakey heads, small and medium sized jigs, senkos, jerkbaits, small grubs, swimbaits and even slider rigs. It loads with a light weight, but has the shoulders and strength to get into a street fight with a green or brown brawler. This is an impressive rod. While one felt this rod was a bit heavy and would have appreciated a faster tip, another would felt it very comfortable, had great action and can be used for a variety of techniques.